Cut off the crusts from each slice of the bread. Roll out the slice of bread with rolling pin to flatten it slightly, but keep it square. 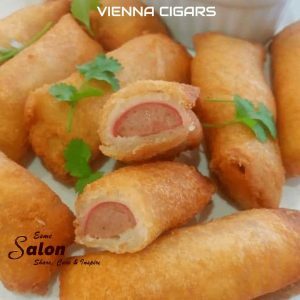 Add a quarter piece of Vienna to each slice of bread and roll it up like a cigar. Seal the ends as well as the sides with a bit of water, by using a kitchen brush and paint it with water. Do not make it soggy, just enough to seal the edges. Deep fry the ‘cigars’ until golden brown and crispy. Decorate with parsley and serve with An easy snack in record time: Vienna Bread Cigars with a tangy dip. Enjoy.